In a long row of widely spread discussions about "Six reasons why ..", we (Markus Eisele aka @myfear and Michael Hüttermann aka @huettermann) now offer the following contribution named "Six reasons why you should revise you opinion about the Java-Univers in 2011". In the following, we'll discuss recent movements, but also misunderstandings and common discussions. Let us know what you think. Almost every day you can read about some wise experts’ predictions. That’s great, isn’t it? And so helpful! You just read it, and know about the future. But why don’t these people share their insights about the next raffle? Why don’t they publish the future prices of shares? They just write about boring technical things and even worse, they consider it to be of value for others. Why bother? Well, thinking about it, you may start with the question: what is an “expert”? Is it a tool vendor who has a prediction about how his prediction may help to increase sales? Or is it a person who gained some new insights or read about something that is totally new for him (but not for others?). Maybe these are good reasons to claim that this is a subjectiv prediction and perhaps also some good motivations for excellent, but absurd or trivial pro tips. A different option is that the prediction is just a “discovery” or a description of the current status or the recent (or even past) movement. 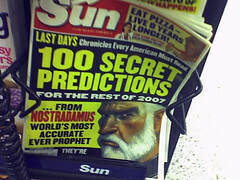 Interesting enough some predictions are that generic or mathematically correct that they will fulfill for sure. What about: “My five predictions why Hudson or Jenkins will be very successfully”. The popular continuous integration server “Hudson” was forked to two different tools, Hudson and Jenkins. Actually, in retrospective, it is not that important why the fork exists or who forked. What is more important is that politics should stop soon. Please stop bashing the other side. Please do not again and again describe what happened although almost daily (and interesting) discussions and new views pop up. It may influence some other people if persons again write about their view of the history. But, what really counts is the future. Both products started from the same (source) base. Now it is up to the key people and the community to further develop their individual products. On the one hand, we now have a product Hudson that is pushed by Oracle and Sonatype. On the other hand we have Jenkins that is driven by the majority of the former Hudson (core) contributors. The bottom line is we now have two different products that will certainly find their individual paths. And time will tell. From time to time I’m involved in discussions about certifications. Some of these discussions are driven by facts, others by plain emotions. I think it is pretty clear that certs cannot substitute practical experience. But certs can check skills and knowledge as well as help to train and to reach and foster standards. OK, you may ask what “knowledge” is. Is “knowledge” the qualification to be able to discuss with others about the same topic, having a shared glossary and the same general understanding? Practical IT skills of course also comprise to be able to transfer former decisions and solutions to new ones, in a different context. And it is all about experience. But certs can act as a handy direction sign that also tells about skills as well as the ability and willing to pass them. You should always balance the importance of certs. Is a two days seminar really more important than being a PhD? What about this closing thought: having a certification is probably not a disadvantage, it will not endamage you. But solely relying on it won’t be enough as well. Have you seen the olympic wintergames last year? Not a bit? Sorry, you are into programing not sports. Great then you probably have seen the great Medal Wheel application which was advertised a lot in the whole Java universe. It was written with Java FX and it seemed like a step into the right direction. Until JavaOne. Oracle revealed their plans to redesign their 1.x branch into something worth wearing the 2.x version number. Some major changes will happen. Back to APIs and good bye scripting. What was thought of as a Adobe Flash killer and should be used by webdevelopers knowing how to script things is stepping back into plain old Java. What looks like a revolution is a great step back. Back to Swing like programing. We have seen this before. Do you know any good reason why we should get back to Java on the desktop? Have you seen what's happening with Webapps lately? HTML 5 seems the new pandoras box that is opened by more and more vendors. And it is everything Java FX is not. It's widespread, it's well known to many developers, cross device compatible and it has anything you need to build great apps. Java on the desktop is and will stay dead. The three letter acronym that has had it's most famous moments at the end of last year. Even if hardly any Java developer out there is a member, it's still thought of as a community process. how politics work. You can have great success with changes that are worthy to the party being in power. But you have to play the opposition game if your not. And so anybody has to decide on it's own if this works for him. But we all know, it will not work without any organization. "The Sun we knew is gone!". What a big sentence. And I love it. Six words to describe, that something we got used to for long years is over. There were so many great people working at Sun. Talking passionate about their work. Blogging, Speaking, Writing, Living what Sun was all about: Innovation, Openess. You never ever had the feeling of being outside of Sun. Even if you were only working with their technology. It was the perfect idea of being in the middle of ongoing research and development. Every single user counted. Nobody ever actively heard a product-manager talking about revenue or value add-ons. Everything was free. And making money a part time job. Compared to Oracle it could be seen as the complete opposite. You always have spokespersons, product-managers, vice presidents or other big names in anything. And safe harbor statements as the final straw. Even if you are actively involved with any of the open source products around, you can't fight the feeling that anybody else is driving. And you could swear you are holding the steering wheel in your hand. If you believe this is anything we can hope for with a company like Oracle you are wrong! Fact is, Oracle is the company you feel and see. But they are able to change. And they don't get tired about telling anybody that the Java community is the most valued asset they got with the Sun merger. There are some good guys out there, that you can help. Look out for the OTN team, the ACEs, the Java Champions. They all love their technology. And they are willing to give Oracle a hard time while getting closer to their most valued asset. 1. I think the various metrics regarding plugins/mailing list volume/activity speak mostly in favor of Jenkins. I predict that Hudosn will only survive in "You must use Oracle tools if there are available for what you want to do"-contracts. 3. I agree. I just wonder why they can't call it "Swing 1.1" and say "we have increased system requirements". 4. I agree. Basically it doesn't make much sense to cooperate with Oracle. They will be constantly trying to backtsba you. 5. Well, you could be right. But what really matters is the trust which Oracle has thrown out of their window. There behavior is a systematic harassment of technology-interested people. Working with them makes people loose interest in otherwise exciting technology. "Yes, the Java7 developer preview license is unfair and draconian, but we will look at that later". I'm just sick and tired of Oracle trying to introduce political positions into technological processes. Thanks for your comment, Steve! I disagree about certifications classified as nonsense. Every initiative that motivates people to study is always a positive thing. For those who don't have a north to guide their studies, certification programs are excellent references. I don't have a Java certification and I don't plan to have one, but I'm fine with its existence. Actually, I would recommend it for some colleagues who don't know what to study and how. Thanks for your comment, Hildeberto.